Abell 2199 is a galaxy cluster in the Abell catalogue featuring bright cluster-galaxy NGC 6166, in the center of the image. NGC 6166 appears to be a quadruple galaxy with four cores. The four objects however appear to have very different redshifts so they may in fact just be superimposed galaxies. Modelling suggests that there are two elliptical galaxies here and one of them appears to have caused a wake as it passes through the outer envelope of NGC 6166. 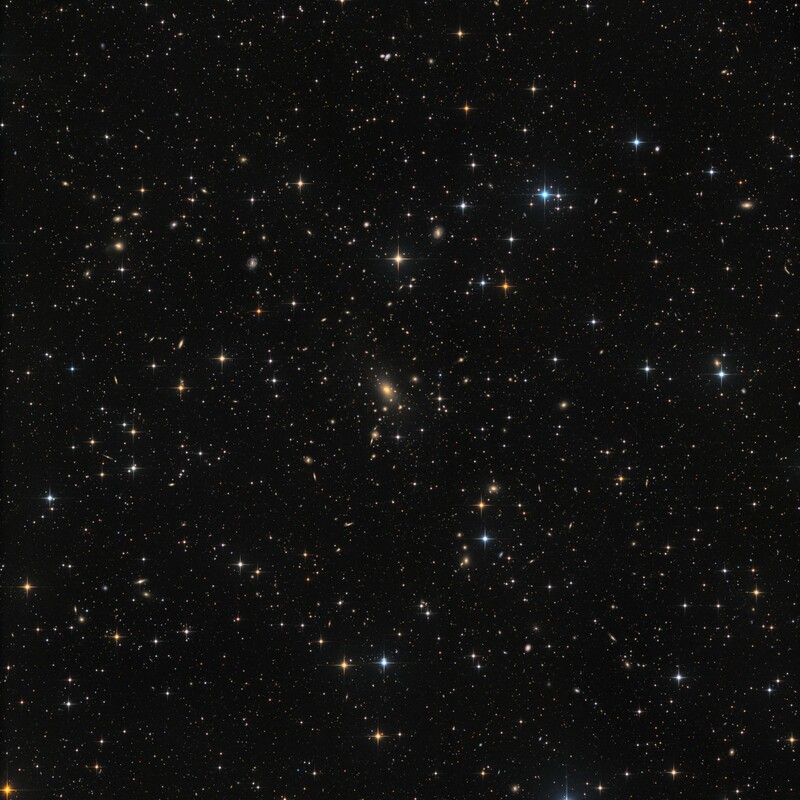 Abell 2199 is part of the great wall of galaxies whose other prominent clusters are the Coma Cluster (Abell 1656), The Leo cluster (Abell 1367) and the Hercules cluster (Abell 2151). The cluster contains at least 88 and probably of the order of 200 galaxies. However on the PGC annotated image it is clear that there are a lot more galaxies visible. Not sure what will take the least effort: counting the stars or counting the galaxies.